Born in Suresnes in 1950, self hand-made and polyvalent. He has long wandered on the frontiers of art, evolving in the world of fashion and couture before moving on to the act of creation. Bored with ephemeral world of fashion, Sylvain Subervie takes part to give life to timeless works : he surrenders to the shaping of noble materials such as iron or rock crystal, a mineral that attracts and fascinates him. 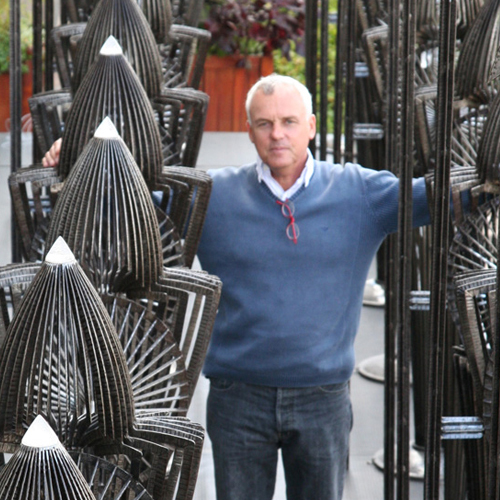 The wrought iron was a key step in the artistic accomplishment of Sylvain Subervie. Became the expression of his own personality, his talent comes to life in a balance of power that is exerted between the wrought iron and himself, and still the same until today. A first collection of a design furnitures takes shape in 1995. He uses the natural elements by bringing together in one object. No research work, a single wave of emotions through it, and the drawing is made on paper. Every part of Sylvain Subervie is an affirmation, a truth that has long sought a humble truth and transformed into beauty. So by intuition or talent, Sylvain Subervie was able to enroll in the great French tradition of decorative arts. He is represented by Marcilhac Gallery in Paris, during great international fairs like PAD, La Biennale of Paris, The Salon NYC, Art Cologne, Art Basel Miami, Brafa…where his name and his work has rubbed shoulders with the great domain of Art Deco such as Printz, Prouve, or Giacometti. Over time, Sylvain Subervie Art expresses a different scale, and gives life to monumental works. The first was the « Giraffe », the famous « Banc de Poissons » a French culture heritage since 2010… the Army of ” 1,000 Shield Warriors “ war against war. He signs finally his artworks with « la forme par le vide ».